Outset has supported an ambitious new installation by Korean artist DO HO SUH on a footbridge above Wormwood Street – one of the busiest roads in the City of London, near Liverpool Street Station. 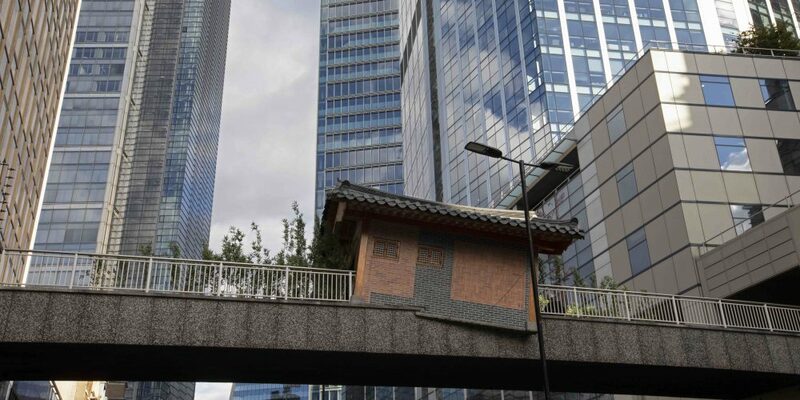 Invited by Art Night and Sculpture in the City to respond to the migrant history of the East End and the City of London, Suh has created Bridging Home, London, a replica of a traditional Korean house, his childhood home, and surrounding bamboo garden, which appears to have ‘fallen’ onto the Wormwood Street footbridge. This is DO HO SUH’s first large-scale outdoor installation in the capital. Bridging Home, London reflects the artist’s own experience of moving across continents and between cultures and continues his career-long investigation of memory, migration, the multiplicity of the immigrant experience, and home as both a physical structure and a lived experience. Installed from September 2018 for a minimum of six months, the work is part of Art Night’s Legacy programme – a series of co-commissions, acquisitions for public collections and longer-term projects beyond the festival itself. It forms part of the eighth edition of Sculpture in the City. Bridging Home, London was co-commissioned by Art Night and Sculpture in the City, and curated by Fatos? Üstek. The Garden design is supported by HOK with the participation of Blooming Artificial. This commission is supported by Arts Council Korea and Arts Council England Joint Fund, the City of London Corporation, the Korean Culture Centre UK, Phillips, Saja Foundation x Outset, Savills, Simmons & Simmons. Further thanks to Lehmann Maupin, Victoria Miro, Velorose, Wedlake Blake, The White Wall Company. This project is part of Outset’s partnership with the inspiring Saja Foundation. Outset provides crucial funding to support the artistic ecosystem, but we wish to take this further. The Saja Foundation pays homage to Saja Tourbah Dada with a mission to help people through the power of art, by supporting artists and providing art therapy in hospitals. To find out more, click here.